with Advent Tree Pastel Version! Little kids are counting the days until Christmas on their fingers. There are so many special things about Christmas. Why save the fun until the Christmas Eve? 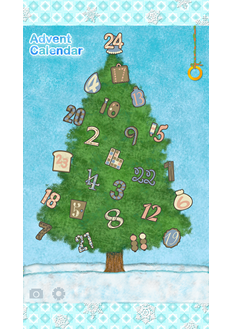 This is an Advent calendar app that makes every day of December special. 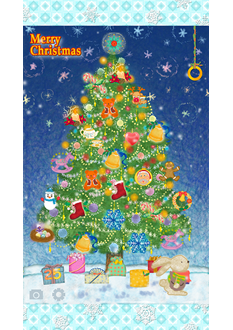 This is the Pastel version of Advent Tree app from Kurotekko Kids. 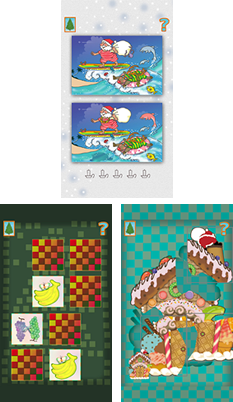 Fun mini games and cute ornaments are waiting for you. Find pleasure in Advent Tree . The ornaments on the Christmas tree are numbered 1 to 24. They go with the days in December. Start with the number 1 ornament. When you tap on the ornament, a fun game will pop up. Once you beat the game, the ornament will change. Who knows what you will find? You get a different game with each ornament. Beat all the games and decorate your own tree! These are all easy games, but our little friends might need a bit of help when they play. Once you open a game, you can play it again later, anytime. *Don't miss out on the sweet treats from a flying whale! Can you find all the neat little tricks in the app? Go look under the tree! Once you've got a great looking tree, why don't you send it as a Christmas card? You can send it via email, Twitter or Facebook. Show it off to grandma and grandpa, and all your friends! In the 'Calendar' mode, you can play one game a day, starting on December 1st. 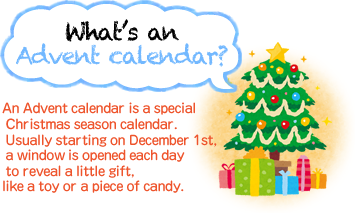 The 'Calendar' mode is the best way to open up a game each day and enjoy a journey towards Christmas. We wish you a fantastic Christmas and a happy new year with this app, Advent Tree Pastel Version !